Passengers arriving in Southampton on 7 July 1934 beheld a sight that would have been unimaginable just a few years earlier: Cunard Line house flags flying on the masts of White Star liners and White Star burgees hoisted aloft Cunard vessel masts. The struggling shipping lines had concluded their merger on 10 May 1934. Now it was time to begin sailing all Cunard-White Star Line vessels under the same flags. For more than a few passengers and crew, it seemed like a world turned upside down. Departing Southampton that July Saturday, Aquitania and Alaunia flew White Star’s burgee below the Cunard flag. 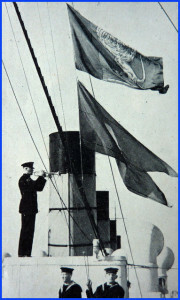 Meanwhile, Olympic and Homeric unfurled Cunard’s flag below the White Star burgee. It lasted that way until 1950. Thereafter, only Georgic (1932) and Britannic (1929) would regularly fly both house flags, and then always with the Cunard flag on top. Soon, the White Star burgee would only appear in books, movies, museums and private collections—and, in the 21st century, on the World Wide Web.